In certain circumstances a polyp from one coral may devour a polyp from an existing coral of a different colour. An attacking coral must always be at least two polyps large. A coral attacks by adding a third or additional polyp onto an adjacent space occupied by the unprotected target polyp (and thereby consuming that target polyp). The attacking polyp tile replaces the consumed polyp tile from the attacked coral. The consumed polyp is removed from the board and placed in front of the attacking player's screen. This is the key way for players to increase their movement options. 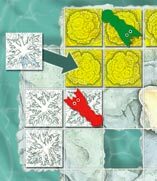 Example: the coral tile to the left shows that the white coral is stronger than the yellow coral (irrespective of the size of the corals), because the white coral is at the top of the coral tile and the yellow coral is at the bottom of the coral tile. White corals that are at least two polyps large can therefore attack yellow corals (see Coral tiles and alga cylinders). In the attack illustrated in the diagram to the right, the white polyp tile replaces the yellow polyp tile and the yellow polyp tile is removed and placed in front of the attacking player's screen. Hint: If a player accumulates several polyp tiles of a colour they do not want, it may be possible to play these polyp tiles in action 2 and then consume them in action 3. In this way the player will accumulate some valuable consumed polyps. Hint: Consumed polyp tiles can be played without limit, in addition to up to four polyp tiles of the same colour from behind a player's screen. Therefore in action 2 a player should consider whether it is possible to consume one of their own corals in its entirety. 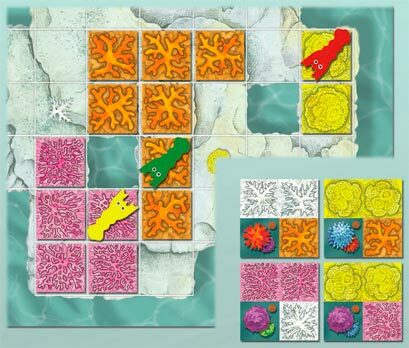 It may then be possible to immediately play the newly consumed corals in action 3 elsewhere on the boards, converting one of the consumed polyps into a larva cube if required. In this way it is possible for quite large corals to move across the boards. A coral will never attack another coral of its own type. It can however merge with a coral of its own type, provided that there is not a shrimp on both of the two corals. As a result of a polyp being devoured, a coral may be split into two or three separate corals. These separate parts continue to survive as separate corals. It is red's turn to play. Behind their screen red has three yellow polyp tiles, four white polyp tiles, a yellow larva cube and a white larva cube. In front of their screen red has a white (consumed) polyp tile. As indicated by the coral tiles (the relevant coral tiles are shown inset), white and yellow corals are currently stronger than orange corals, pink corals are currently stronger than white corals and yellow corals are currently stronger than pink corals. Before red moves, the position is as shown in the top diagram. During red's turn, red undertakes the actions detailed below. The results of these actions are shown in the bottom diagram. Under action 2, red plays the yellow larva cube and the three yellow polyp tiles. The first polyp tile is placed on the space marked one. Red's yellow coral is three polyp tiles large, so it is more than big enough to attack the orange coral. Yellow corals are stronger than orange corals so yellow corals can consume orange polyp tiles. Red plays their other two yellow polyp tiles (onto the spaces marked 2 and 3, and consumes the two orange polyp tiles which were previously occupying these spaces). Under action 7, red now exchanges one of the two orange polyp tiles which their yellow coral has just consumed (and placed in front of their screen) for a purple alga cylinder. Red places the purple alga cylinder on top of the yellow and pink (bottom right) coral tile. As a result, the other coral tiles that also display a purple alga (and are not already covered by an alga cylinder) are turned over. In this example the pink and white coral tile is therefore turned over. White corals are now stronger than pink corals. Under action 3, red now plays the white larva cube, the four white polyp tiles from behind the screen and the one white consumed polyp tile (which red's corals had consumed in an earlier turn) from in front of the screen. 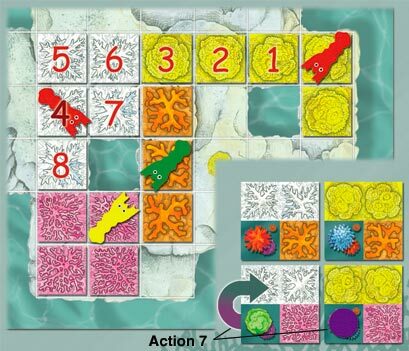 The first two polyp tiles are played into positions 4 and 5 to create a new coral. As this coral is two polyps large it can attack other corals. Red then plays polyp tiles into positions 6 and 7 where it consumes two orange polyp tiles and into position 8 where it consumes a pink polyp tile. Under action 4, red now places one of their shrimps onto position 4 in order to protect the white coral. At the end of their turn red will then choose one to three new polyp tiles and a larva cube under action 10. Red will also have three (of the four) orange and one pink polyp tiles in front of their screen, which were consumed by red's corals during this turn.